To satisfy even the most avid culinary aficionados, we decided to introduce the concept of unique and delicious tasting menu that draws upon both seasonal and local ingredients. Changing every four months, it is a unique gourmet experience for all. Do not miss this incredibly delicious experience! Our tasting menu is served for both our hotel and guests from outside only until 19:30 every day. Of course, our complete restaurant a la carte menu where you can find excellent food inspired by Czech cuisine is available to all our guests. Recommended dress code for all our guests at the restaurant is smart casual, during evening hours. Breakfast is served from 8:00 until 10:30 and the price of breakfast is included in the price of the room for our hotel guest. For non-hotel guests, we charge 440,- CZK for our a la carte menu selection. Guests can enjoy our snack menu from 12:00 until 16:00. In case you will be interested in reserving a table in our castle restaurant, please do not hesitate to contact our F&B Manager Stanislav Prokop. 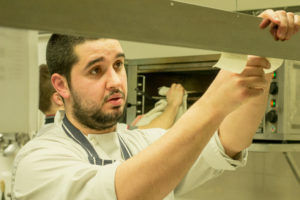 What brought Michal to cooking, was curiosity! He worked at a place, where according to him they cooked to a high-class standard, so he decided to start learning. His ambition to know more brought him to university, but after five semesters he gave it up: studying and working in the kitchen full time did not come together. As he says frankly, he still enjoys it. He perceives a high gastronomy as a discovery path, often hectic, but madly inspirational. 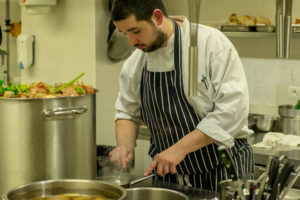 He came to Chateau Herálec as an experienced chef, but after 2 years he left and collected further experience in Prague, Germany, and the USA. Eventually, he returned to the castle and today he and his team are cooking honest Czech cuisine. He loves French techniques, often laborious recipes. He claims, however, that honesty simply pays off in the kitchen. In our kitchen, we cook from local ingredients, and from our own vegetable and herb gardens, in the greenhouse, or in the field under the granary. We bake our own pastries, cakes, and bread, and Michal would like to give his successor once. Maybe in this beautiful family project, the quack will become a symbol of something that can last for generations. As always, my team and I have prepared for you a wide range of tastes, smells, and ingredients, which this lovely season offers. In the menu, you can find the classic and traditional ingredients, such as asparagus, morel or ramsons. However, if there was something you should not miss from our menu, it would be for sure our castle ham with bits of home-made sausage, asparagus cream with morels. From the main courses, we highly recommend trying the baked veal with mashed potatoes and ramsons. If you still have room for something sweet, try our fresh and delicious rhubarb dessert, which is served with home-made waffle. This waffle is baked on the historical machine of the castle lady Mrs. Alexandra.